Energy (and carbon emissions) required to bottle and transport the water. Local gravity fed or groundwater supplies are used less, and their quality may decline. New South Wales Premier Nathan Rees ordered all State Government departments and agencies to stop buying bottled water on 8 July 2009, following swiftly on news of a small-town ban. 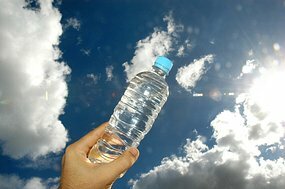 The measure comes hot on today's news that the town Bundanoon, in the NSW Southern Highlands, is set to become the first community in Australia to ban the sale of bottled water. Mr Rees had already ordered all ministerial offices in Sydney's CBD to make do with tap water when he took on the top job last year. He has extended that instruction, saying the State Government should lead by example. The Premier says the move will save taxpayer money and help reduce the impact on the environment of producing and disposing plastic bottles. Testing of bottled water has detected radioactive materials, arsenic and other chemicals that can leach into the water. Virtually no regular testing is done. BPA, an extremely toxic substances, is present in 5 gallon plastic containers used to transport "bottled" water. Bisphenol A, commonly abbreviated as BPA, is an organic compound with two phenol functional groups. It is used to make polycarbonate plastic and epoxy resins, along with other applications. The public's right to water is being auctioned off by government to private corporations such as Nestle. This page was last modified 23:39, 6 June 2013. This page has been accessed 14,879 times.